The leading Czech developer of gambling software for online casinos, Endorphina company, recently announced the release of a new slot Lucky Streak 1. The release was successfully held on November 8. Autumn is a time when many people have a bad mood, although thoughts about the upcoming New Year's celebration give an expectation of magic. Leading slot developer at online casinos Endorphina offers to abstract from negative thoughts and play a new slot Lucky Streak 1. The Lucky Streak 1 slot was introduced by Endorphina as the beginning of a new series of classic slots. Simple rules of draws come at the first place, where multifunctional bonuses and prize features are excluded. Instead, participants expect decent winnings for the same combination of characters and risky mode. Fruit themes are always relevant among gamblers. The game called Lucky Streak 1 is a continuation of the classic fruit series. 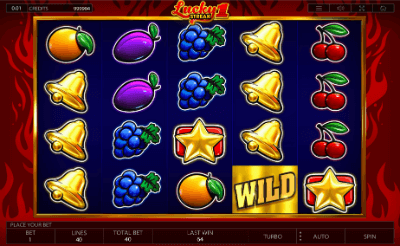 The new video slot Lucky Streak 1 has added several games from Endorphina studios` collection in which fruits are used as standard characters. Among such slot machines of the company, you can recall the popular slots Fresh Fruits, More Fresh Fruits, Sparkling Fresh and Ultra Fresh. In Lucky Streak 1, Endorphina has modeled the traditional gaming atmosphere by adding some fiery effects. This will immerse players in the world of nostalgia, evoking positive emotions and making their hearts beat faster. In the new slot, as in all previous ones, there is consistently beautiful and carefully traced HD graphics. Vivid images of fruit on the drums, perky music, easy gameplay and strong dynamics will give a positive mood and exciting game. The slot runs on both PC and mobile platforms. The new gaming machine has 5 reels and 4 rows of symbols. In addition to the unusual scheme of the playing field, the player can choose the number of active lines, varying their number from 1 to 40. From 0.01 to 10 coins can be placed on each line, the maximum bet is 400 credits. The slot has a classic double-up risk game with a choice of a card of greater value than the dealer has. The highest koefficient is brought by winning combinations of gold bells and red sevens. A set of 5 identical icons on the active line in the first case give a multiplier of x300, in the second - x1000. Visually, the Lucky Streak 1 does not stand out from the rest of the classic slot category. Given the high payout rates of the Lucky Streak 1, users need to consider a betting strategy option for low and average values of monetary units. You can see bright juicy fruits on the screen of the slot machine: plums, lemons, oranges. In addition to them, there are symbols of bells. In addition to basic, there is also a wild-symbol, which helps to form the prize combinations and brings even more points. The slot is controlled using the bottom panel. The spin is started by pressing the button in the lower right corner. To the left is the auto-play activation button. In the middle - the scoreboard, where you can see the amount of winnings in the last spin of the reels. Simplicity and at the same time originality and brightness of the new slot machine Lucky Streak 1 - that is what will attract all fans of gambling.